5.0 out of 5 starsthis book is simply ... Exquisite! Ah, there is so much to say about this book!! In a single sentence, I would simply say: READ THIS BOOK. Read it if you want to laugh – Alex’s humorous story-telling makes you laugh even about mis-adventures and close encounters that could have ended quite serious..
Read it to understand that conservation can only be done in tight collaboration with locals and nothing less but high respect and care for their culture, religion, way of living. damn …I so much wish to have been part of that team! Alex, Thank you for sharing these rare life moments with the world. Your care, knowledge, experience and infectious drive and passion paint each and every page. What an inspiration and hope for solving some tough challenges ahead. All: GIFT this book. I already gifted 5 copies and plan to do more. Gift it to those who have curious minds, those who care about the well being of the planet - people, animals, nature; Gift it to young people – who knows? You just might inspire a next ‘Alex’ ! 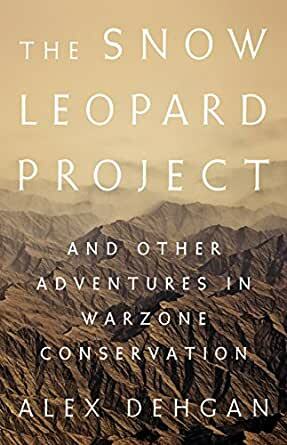 This is an excellently written and compelling set of stories about establishing/developing conservation work in Afghanistan....very important to get folks to read this! I loved the author's ability to tell his story in a very personal way, holding my attention during the details as well as the edge-of-my-seat moments. We learn the science within a historical perspective on the global stage. He makes me care, and want to learn more. What a big life he has lived and important legacy he has left. Alex Dehgan does an excellent job of bringing you to the front lines of conservation and conflict in this well written book. Highly recommend it for all interested in how to save the wild of the planet in the face of political upheaval and the weakening of civil societies.